We report on the observation of the forward degenerate four-wave mixing in four composite samples with Cu nanoclusters embedded in fused silica. The mean diameters of the copper particles in the four samples were 5, 7, 10, and 13 nm. 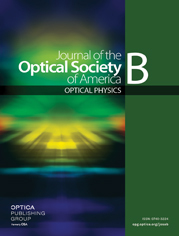 The independent tensor elements of optical Kerr susceptibility were measured with different wave-mixing polarizations by use of 35-ps laser pulses from a mode-locked, frequency-doubled Nd:YAG laser. The measured third-order susceptibilities were on the order of 10−9–10−8 esu; the response time of the nonlinearity is faster than the laser pulse duration. The experimental results are consistent with a d−3 size dependence predicted for quantum-confined conduction band electrons in Cu nanoclusters. a The optical density (O.D.) is related to transmission T by O.D. = log(T).